Woodlands of Fiore is a single family home and townhome neighborhood built in the 1990's. 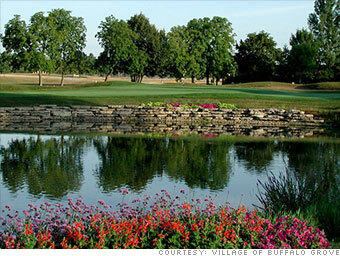 The Woodlands of Fiore is located in Buffalo Grove, Illinois on Buffalo Grove Road, south of Route 22 (Half Day Road). Woodlands of Fiore expert, Judy Greenberg, will be listing a lovingly cared for 2 bedroom, 2 bath townhome in Woodlands of Fiore. This open floor plan Woodlands of Fiore townhome offers an enormous Great Room featuring a marble surround fireplace, bay windows, vaulted ceilings and French doors to balcony with golf course views. Additionally, the Woodlands of Fiore residents attend both the award-winning School District 103 schools and Stevenson High School! If you think this Woodlands of Fiore townhome might be right for you or if you are interested in Woodlands of Fiore, please call or email Judy Greenberg at 847-602-5435. She is standing by to answer your questions or schedule a time for you to walk through with a member of her team. You can also visit her at www.allchicagohomes.com, the 2014 Chicago Agent Magazine Agents' Choice Award Winner for Best Agent Website!